Hardcover: Yale University Press, 2007. In this work, Harold Bloom again combines his lifelong interests in religion and literature. He begins by observing our present-day obsession with angels, which reached its greatest intensity as the current millennium approached. For the most part, these popular angels are banal, even insipid. 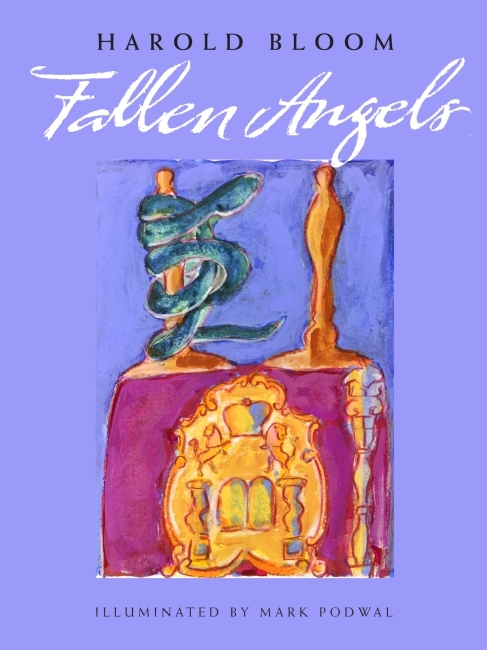 Bloom is especially concerned with a particular subspecies of angels: fallen angels. He proceeds to examine representations of fallen angels from Zoroastrian texts and the Bible to Milton’s Paradise Lost to Tony Kushner’s Angels in America, arguing that familiarity with this rich literary tradition improves our reading and spiritual lives. Bloom’s text is accompanied by more than a dozen original watercolors, line drawings, and illuminated letters by award-winning artist Mark Podwal. Every angel is terrifying, Rilke wrote. For Bloom, too, this is true in one sense, since he maintains that all angels are fallen angels. The image of Satan, the greatest of fallen angels, retains the ability to fascinate and frighten us, he argues, because we share a close kinship with him. Indeed, from a human perspective, we must agree that we are fallen angels. Fallenness is ultimately a human condition: the recognition of our own mortality. Throughout world literature angels have always served as metaphors for death. We may take consolation, however, in our double awareness that angels also represent love and the celebration of human possibilities. Mark Podwal is the author of ten books and has illustrated more than eighteen others, including five by Nobel laureate Elie Wiesel. His works are represented in the collections of the Metropolitan Museum of Art, The Victoria and Albert Museum, Carnegie Museum of Art, and many others. He contributes 4 black-and white and 9 color illustrations.